Thursday was Yoli’s birthday and her dad insisted we have a big meal of salteñas to celebrate. So we came over in the late morning to his place so Yoli could watch/learn/help him prepare the food. A big wind had kicked up that lasted all day. Dust was flying all over the place. It was Ceti Alpha V come to life. 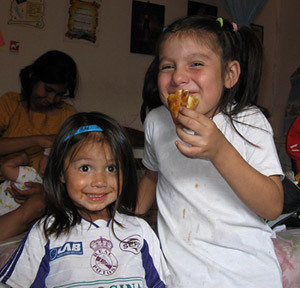 Yoli remains a Bolivian citizen, though she lives in the U.S. as a permanent resident. That situation can be uncomfortable come election time. Problem 1: She can’t vote. The Bolivian constitution provides for absentee voting, but unfortunately the Bolivian government is far from being capable of making this a reality. Essentially, Bolivian ex-patriates (and there are a lot of them here in the States and in Europe) are disenfranchised. Problem 2: She was chosen to work the polls this year. In Bolivia everything related to the elections carries penalties. The government selects people to man the polls, and if you don’t show up, you risk being fined or jailed. Obviously this is tricky for us, but we sent a copy of our marriage certificate to prove that she is living in the U.S. and not in Bolivia. Funnily enough, this also happened when Yoli was in the U.S. the first time (2001). After months of long waiting, we finally got a new scanner to replace the old one (which I’m still trying to sell, hint hint). So here are a few more photos from the days before the wedding and afterward. 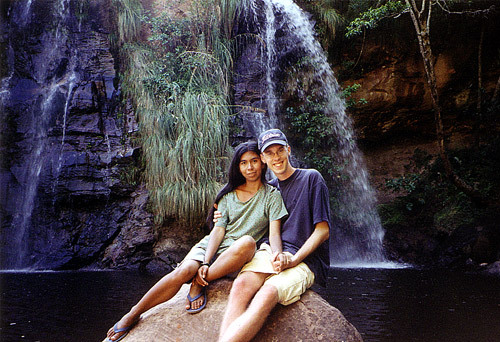 Yoli and I at “Las Cuevas”, a scenic spot between Santa Cruz and Samaipata with lots of waterfalls. This picture was taken the same day I badly sunburned my legs, but before they had begun turning a deep shade of red that would last for weeks. MARRIED – At long last! Greetings from Mr. and Mrs. Josh Renaud! Unfortunately we never really had a chance to connect my computer to the internet to update the website. We were just too busy! However, rest assured that the week went very well and we are back in the States, preparing to enjoy our honeymoon at Clearwater Lake near Piedmont, Missouri. Of course, you probably want to know about the wedding. It was an amazing and memorable experience. I wasn’t the only one who took photos while I was in Bolivia… Yoli took many with her camera as well. Here are a few that she sent to me recently. This photo was taken by a Canadian friend who volunteers at El Jordán. She gave it to Yoli as a birthday gift. 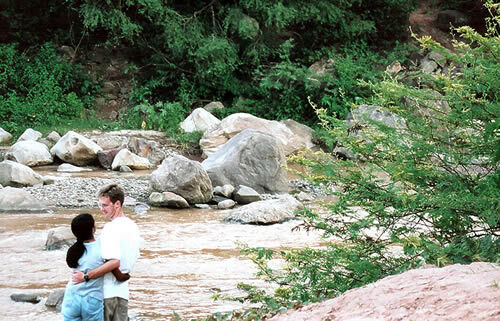 This is a photo of Yoli and I near a river when our group stopped to eat during our return from Samaipata. If everything works out, in 3 months Josh and I will be getting married. This days we’ve been working in “A Handbook For Engaged Couples” by Robert & Alice Fryling. It is a good book. It has given us lot to talk about and helping us to get to know each other better. I have also had weird dreams from too much thinking of him, chatting and talking. It shouldn’t surprise me because my dreams are always weird. Now we are waiting patiently for my visa. Hopefully, we will get it in time for our wedding. August will be my last month at work, so I can focus in September on preparing for our wedding. Well, I’ve been back in the U.S. for a day now, and I’m still somewhat in culture shock. It’s not really severe or anything, but it’s just strange to here in the land of television and very sweet candy. My trip home was bittersweet. It’s always tough to say goodbye, but maybe Yoli and I are getting to be old hats at this. This time is different–we have very real things to look forward to, and very real work to do during our time apart. It was also hard for me to say goodbye to Bolivia, to the seminary and the mission and the people in those places, to her family, to her friends. We did so much more than I ever dreamed we would. I came there to learn about Yoli’s culture and her family; I ended up joining them by getting engaged. I came here to design a website for the seminary; I also designed two brochures and started a website for other ministries. I came, planning to stay for four weeks; I stayed five. Guest entry: See what Yoli has to say! The six months before seeing Josh were very hard, especially the first 3 months after I returned to Bolivia. Saturday night Yoli and I cooked pizza and then we got engaged. We’ve been planning this for a while, and I must admit to you now that I left all the details related to our engagement out of my entries for the past two weeks so it would be a surprise. Friday was another one of those turnabout days. When Yoli was in the States, I took her to the St. Louis Zoo. So Friday she took me to the Santa Cruz Zoo. I noticed the zoos had one thing in common immediately: the same 3-D, block-letter column spelling the word ZOO from the top down.